Between logistics outsourcing, reverse logistics, increasing transportation and storage costs, changing global regulations, and razor-thin margins, organizations must be able to leverage all available advantages in order to be the “vendor of choice” and remain competitive in today’s business world. While technology is advancing processes with robotics, artificial intelligence, and autonomous cars and trucks, supply chains are ultimately powered by people. Maximizing this reality in today’s world is anything but easy. 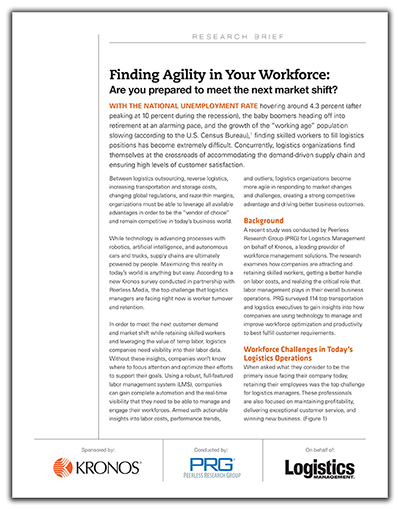 According to a new Kronos survey conducted in partnership with Peerless Media, the top challenge that logistics managers are facing right now is worker turnover and retention.